News & Events - Jerry Martillotti & Associates, P.C. We are pleased to announce that Jerry Martillotti, Esq. 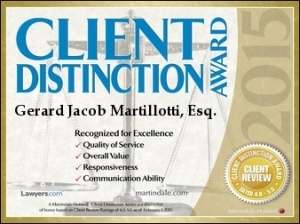 recently received the Martindale Hubbell and Lawyers.com's Client Distinction Award. The Award is in recogonition of the quality of legal service, overall value, responsiveness and high level of client communication that Mr. Martillotti has displayed.